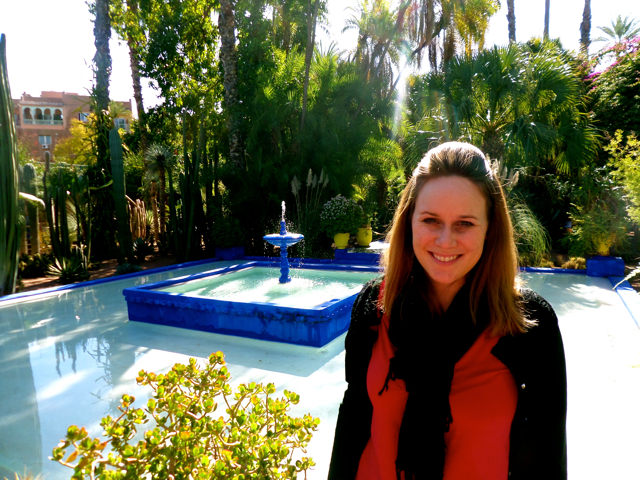 If you’ve been following along on my blog lately, you’ll note one thing is obvious – I love Marrakech, Morocco! Known as the “red” city, the former Imperial City is swimming with a myriad of rich colors, warm people and culture. Here are my top ten must-sees for your next visit. Bin after bin of brightly colored spices line the white walls, flooding the setting with eye-popping brilliance. 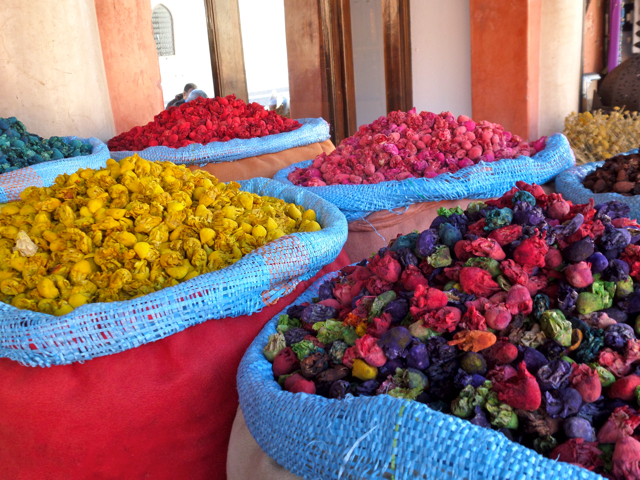 Morocco is the land of spices, used both in intricate food dishes and for medicinal purposes. At any spice market in the heart of the old city, you can stop by for a free explanation of products. The most popular spices to purchase are cumin and saffron. Argan oil is a popular beauty product for skin and hair. Be sure to barter with the shopkeepers if you wish to make a purchase. Even if you aren’t in the market for any particular Moroccan goods, a walk through the souks is an exciting and illuminating experience. From leather slippers and silk scarves to traditional rugs and pottery to postcards and camel trinkets, there’s so much to feast your eyes on. To help find the best prices and get a better understanding of the markets origins and customs, tour with a guide. 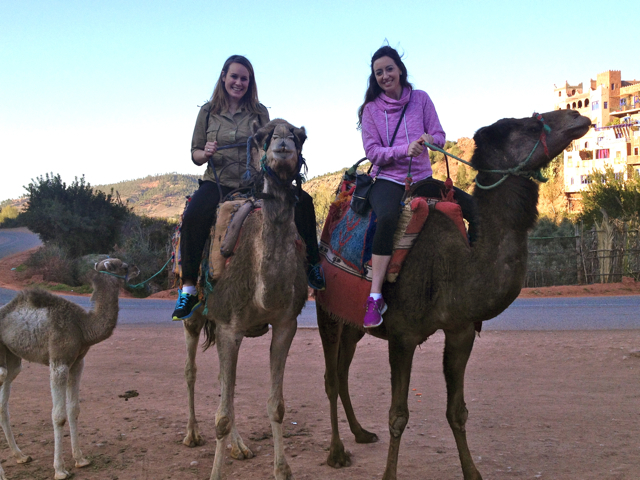 Marrakech is quite far from the Saharah Desert, but that doesn’t mean you can’t find camels! Ok, so it’s a pretty touristy experience but who cares if it’s a blast. Book a camel ride tour at Palm Grove using GetYourGuide. 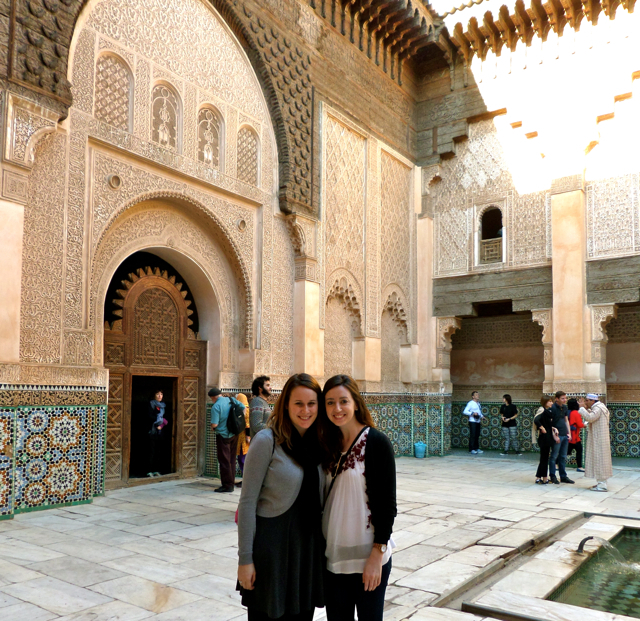 Ben Youssef Madrasa is an Islamic University that dates back to the 14th century. Wander the halls and old dormitories of this ancient University that was once the largest in Morocco. 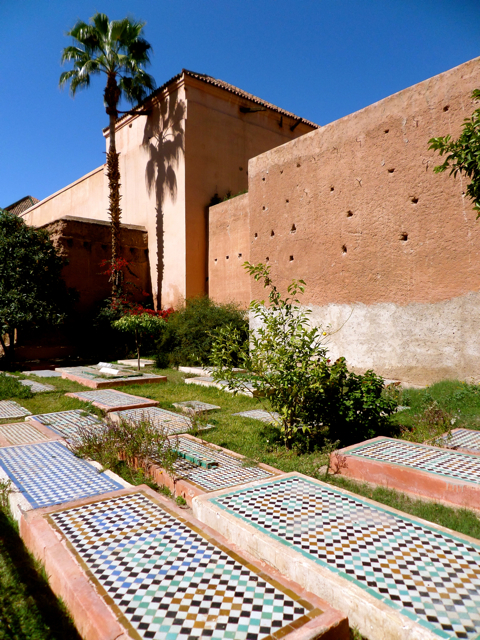 The Saadian tombs are the final resting place of around 60 members of the Saadi Dynasty. Discovered in 1917 and restored to their original condition, the tombs date back to the 1570’s. The twelve columns is the most famous room with its intricate carvings and design work. The main square and marketplace of Marrakech, Jamaa el-Fnaa is a swirl of madness with snake charmers, dancers and people trying to sell you just about anything you could imagine. The square is uncomfortable and claustrophobic, but a walk through is an absolute must. You may even get to make friends with a monkey like I did. 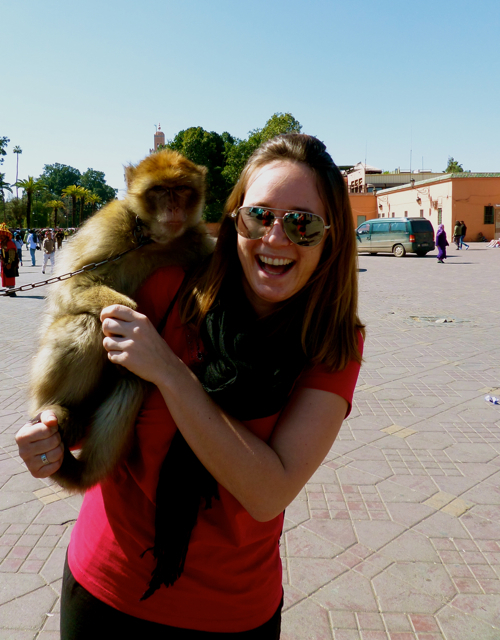 Ok, the monkey was actually uninvited and thrust upon me unwillingly by his owner, but it was an exciting moment. As the sun sets, grab a cup of coffee from one of the rooftop cafes that surround Jamma el-Fnaa and watch as Marrakech’s most vibrant square is illuminated by the colors of the sky. Riads, or traditional Moroccan houses with interior gardens or courtyards, have become a popular accommodation option for visitors to Morocco and especially Marrakech. 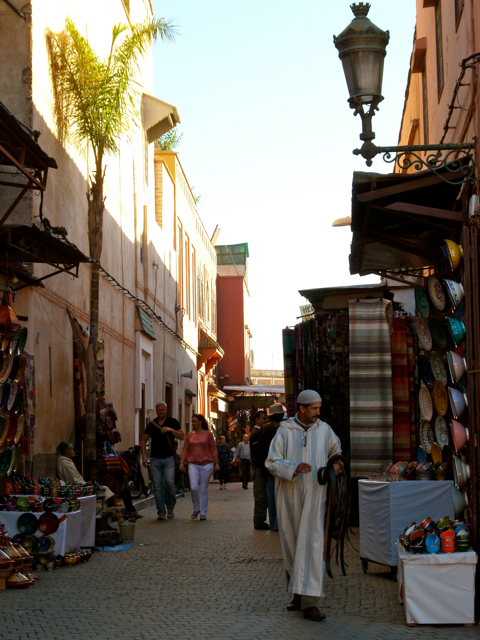 In the medina, or old quarter, of Marrakech alone there are more than 500. 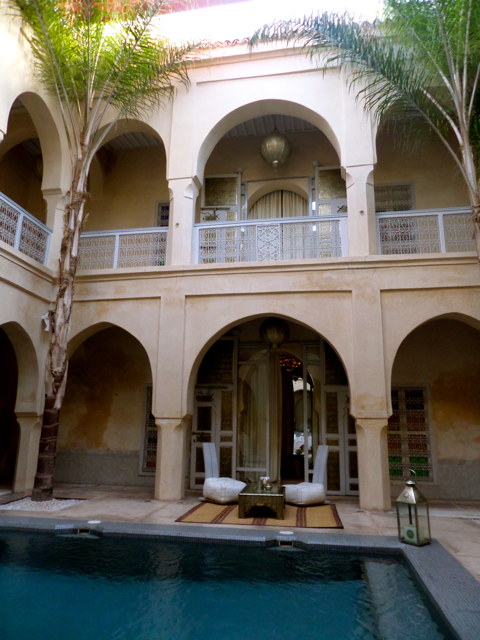 My recommendation for a great place to relax in luxury is Riad AnaYela, located in a converted palace. 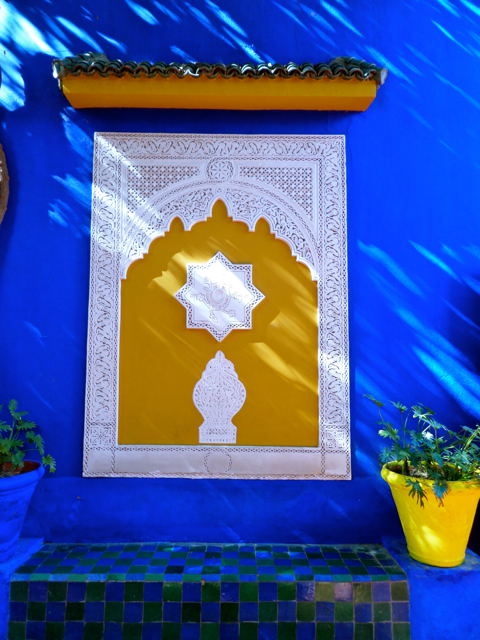 Cobalt blues and mustard yellows will greet your eyes as you wander this garden, designed in the 1920’s and 1930’s by French artist Jacques Majorelle. The buildings here, with their unique colors and architecture are almost more beautiful than the pants and flowers. 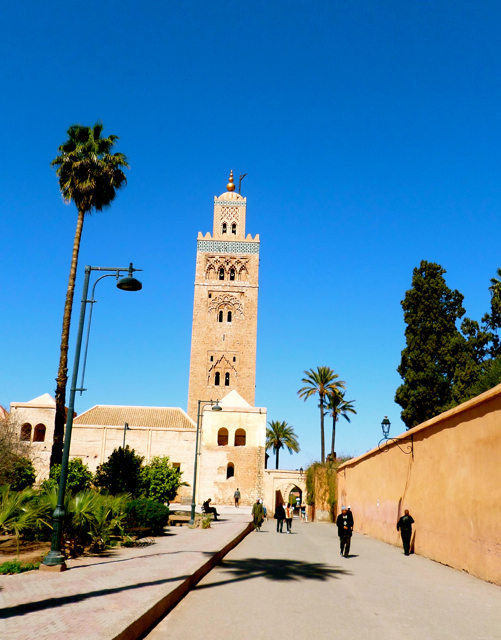 One of the most breathtaking scenes for me was the Koutoubia Mosque, the largest in Marrakech. Tourists are not allowed inside, but just walking around and taking in the minaret ornamented with turquoise was pleasure enough. 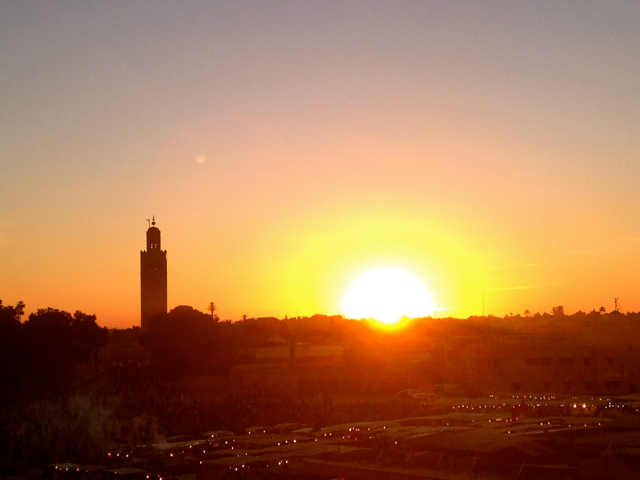 And there you have it – my recommendations for the top 10 things to do in Marrakech. If you’ve been to Marrakech do you have anything to add? Leave a comment below! Great list! I’ve heard about the delicious orange juice in Marrakech. How was it?! Thanks for sharing. Hello fellow traveler Lauren! 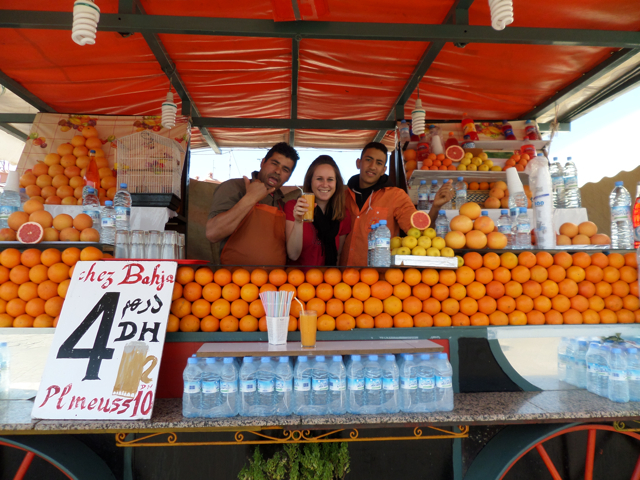 The orange juice in Marrakech was delicious– some of the best i’ve had! Thanks for reading and happy travels back! Nice post and amazing photos. I like your photo riding the camels. I think this was on the way to the Atlas Mountains, right? Yes indeed- this is on the way to the Atlas Mountains. Such a stunning place! To enjoy a great vacation follow our day trip Marrakech. Our day tour Marrakech has given the opportunity to discover city beauty with its culture at lowest price with personal care and great comfort. We hope you will do it all over again ! When you have more time to spend travelling you will need to come back and visit the sahara desert. The Sahara Desert is high on my bucket list. Unfortunately I didn’t make it quite that far out of the city during my time in Marrakech. I need to come back! I truly like this post, I really find it supportive! But could you also tell me, please, in what other riads did you vacation? I now check for Riad Yasmine, but it’s completely booked already :(. Thank you, and keep up the good effort! great article about Morocco, thank you so much for sharing it with us and you are always welcome to Morocco.